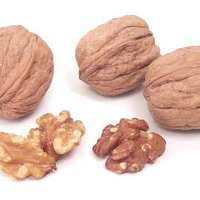 Walnuts are rich and flavorful, and cooks like to use them in everything from fudge to salads. 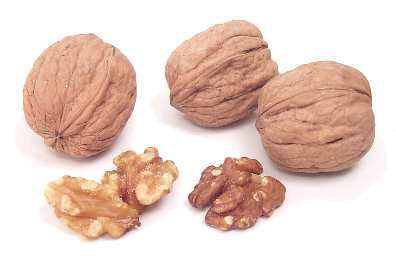 Markets usually carry English walnuts = royal walnuts = Persian walnuts. Less common are black walnuts, which are much more flavorful but harder to shell. To roast, put shelled walnuts on a baking pan and in bake them in a 325° oven, stirring occasionally, until they're slightly golden, about ten minutes. After you remove the nuts from the oven, rub them vigorously with a towel so as to remove as much of their bitter skins as possible. Fresh walnuts are available year-round, but they're best in the fall. Since they're high in fat and therefore prone to rancidity, it's best to store them in the refrigerator or freezer.